It has long been claimed that there is a strong association between high intelligence, or exceptional creativity, and mental illness. In this book, James MacCabe investigates this claim, using evidence from Swedish population data. He finds evidence that children who achieve either exceptionally high, or very low grades at school, are at greater risk of adult mental health disorders. This book opens with an introduction to the epidemiology of psychosis with particular emphasis on cognitive performance and creativity. It goes on to provide a detailed description of the rationale, methods and results of a population study involving nearly a million individuals, conducted by Dr MacCabe in collaboration with colleagues in Stockholm, Sweden, and London, UK. 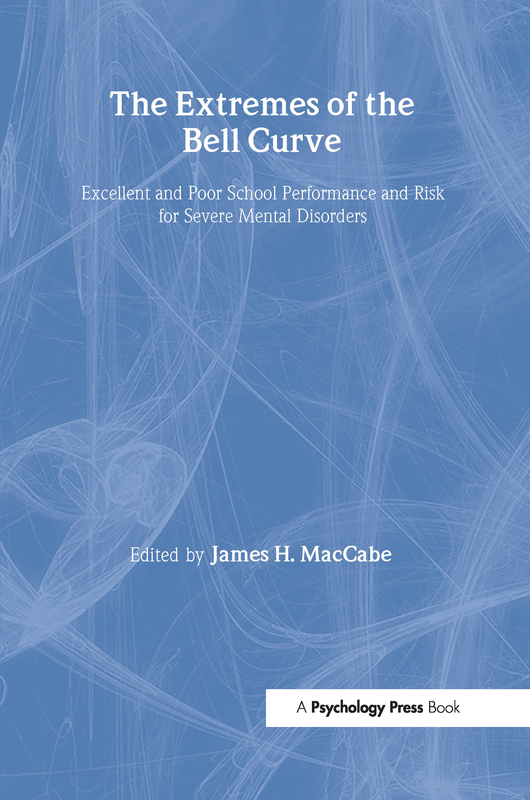 The Extremes of the Bell Curve will be of interest to mental health professionals including psychologists, psychiatrists and epidemiologists. It will also prove useful to those working in education. Background. Intelligence, Creativity and Mental Illness. Pre-morbid Neuropsychological Functioning in Schizophrenia and Bipolar Disorder: A Review of the Published Literature. The Study of Premorbid School Performance in Schizophrenia and Other Psychoses. School Performance and Psychosis: Unadjusted Analyses. Confounding and Interaction: Finding the Model That Best Describes the Data. School Performance in Individual School Subjects. General Discussion. Appendix. James H. MacCabe is Senior Lecturer in Psychiatric Epidemiology at the Institute of Psychiatry, King's College London, where he conducts research on the causes, consequences and treatment of psychosis. He is also Consultant Psychiatrist at the National Psychosis Unit, Bethlem Royal Hospital. Henry Maudsley, founder of the Maudsley Hospital, was the most prominent English psychiatrist of his generation. The Maudsley Hospital was united with the Bethlem Royal Hospital in 1948 and its medical school renamed the Institute of Psychiatry. It is now entrusted with the duty of advancing psychiatry by teaching and research. The South London and Maudsley (SLAM) NHS Trust, together with the Institute of Psychiatry, are jointly known as The Maudsley. The monograph series reports work carried out at The Maudsley. Some of the monographs are directly concerned with clinical problems; others, less obviously relevant, are in scientific fields that are cultivated for the furtherance of psychiatry.